Teletext is transmitted during the unused lines of a Television picture, which may be seen at the top of the picture of a television operating with reduced height. The signal, if seen look like a series of white small dots that flicker as each field is scanned. Each line is capable of transmitting 40 useful bytes of data, another 5 bytes are used for synchronising the clock of the receiver. The time at which the teletext information is transmitted is called the blanking interval. This is an interval that is unused due to the problem of depleting the stored emf within the scan coils. This will be discussed further within this report. The television picture transmitted here in the UK is interlaced, this means that for a complete picture to be displayed there has to be two fields, this is for the odd and even lines that make up the picture. Two fields can be seen in figure 1, 2 fields make one frame. At the beginning of every field there are the teletext data lines, this can be seen in figure 2 and an example of the teletext line can be seen in figure 3. Teletext is becoming a viable method of distributing data from one point to multiple points with relatively cheap receivers. Teletext arose because of a historical accident. 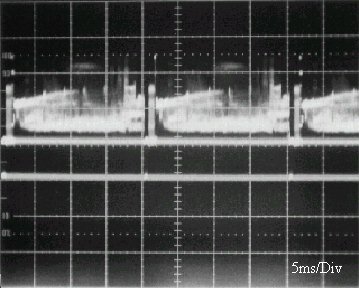 When Alan Blumlein layed down the standards for electronically scanned television in the 1930's, he decided to have a relatively long vertical flyback time - the time it takes for the electron beam to return from the bottom of the screen to the top after the picture had been scanned. This was because the electron beam was deflected, as it is today, by an electromagnet, and a rapid change in the current through this magnet would induce a large back EMF in it. Blumlein was worried that this high voltage would arc through the glass of the cathode ray tube, and make a hole in it. During the vertical flyback time, obviously no picture information could be transmitted. It was a waste of transmission time. This time was eventually put to a variety of uses. Engineering test signals were added to the signal to check the performance of the broadcast television equipment. Then, in October 1972, the BBC announced the idea of a system of Text screens, which could be selected by the viewer, and displayed on the television screen. In September 1974, the Teletext service (as it became known) was started as an experimental service. The standard, however, is almost unchanged today, although several so-called Extension Packets have been defined. The teletext line consists of a row of characters. In the European version of teletext, there are 40 characters per line. These characters occupy an area of 40 centre of the 52 active video region of the teletext line. There are two 6 borders on each side of the character block. As there are 40 characters per 40 , each character occupies 1 . The rows of the teletext picture are transmitted sequentially. This means that the time needed to transmit and therefore display a teletext page is dependent on the number of teletext lines transmitted with every field of the television signal. The teletext page is 24 rows in height. It uses the centre 240 lines of the screen. Each row is ten lines high on the television screen. This is why it is more reminiscent of a home computer chunky graphics display than an ordinary television picture. The display technology of the home computer is similar in structure and this similarity is utilised by some of the teletext services. Datacast lines are not used by ordinary teletext decoders but it would not be impossible to receive these lines. These services, how they are received and their relative security are covered in a later section dealing specifically with "BBC Datacasting". The first two bytes in each line are 10101010. This format is known as a Clock Run In, CRI. They synchronise the system clock to the data rate of the teletext data. The frequency of these bytes is 6.9375 MHz. The lock up of the system clock with the data is essential. The third byte is the framing code, 11100100. The purpose of this code is to allow the decoder to recognise the beginning and end of each byte of data. The fourth and fifth bytes are the magazine and row address codes. These codes are used to ensure that the rows of each page of teletext are displayed in the correct order on the television screen. The sixth & seventh byte carries the page number. The eighth to the eleventh bytes contain information about timed teletext pages. The fourteenth byte onwards contains display data. The Data rate is actually a burst rate, meaning that when data are being transmitted, they go at that speed, but because there are also moments when no data are being transmitted, the effective data rate is considerably less. 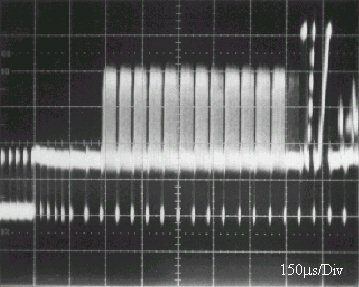 The transmitted waveform for a teletext line is shown in figure 10. It can be seen that the peak-to-peak voltage is 0% to 66% video modulation. The transmission used by teletext is a NRZ (Non-Return to Zero) signal, with suitably phase corrected shaping filters is as shown in the figure 12. This also reduces the intersymbol interference as there is minimal energy above 5MHz. 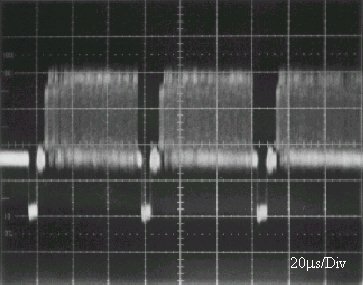 The corresponding one-bit pulse is indicated in figure 13. The data line in table 1 comprises of 360 bits which may be considered as 45 eight-bit bytes. The first three bytes, which have even parity serve to synchronise the bit and byte recovery operation in the receiver. The remaining 42 bytes have odd parity and carry address and control information. The use of odd parity during the variable part of the data line ensures that there are never more than 14 bit periods between the data level transitions in the waveform. This simplifies the recovery of the bit rate clock directly from the data waveform. wrong character rows being stored in the receiver. 1 The Initial specifications set out by the BBC, IBA, BREMA in September 1976 permitting the production of domestic television sets with Teletext. The specification continued to be developed as additional features became available. 2 Provided Multi-language text, and a wider range of display attributes that may be non-spacing. There is a wider range of colours and an extended mosaic pictorial set. 3 Introduced dynamically redefined character sets (DRCS) permitting the display of non-Roman characters, for example Arabic or Chinese. Pictorial Graphic characters may also be defined, allowing the composition of improved illustrations for the text compared with earlier versions. 4 Includes full geometric graphics, and requires computing power to generate the display from a sequence of drawing instructions. This permits graphic displays as good as the highest resolution mode of the BBC-B computer. This level offers a colour palette of over 250,000 shades. 5 Is Full-definition still pictures, permitting an image of a better quality than achievable from a video camera. It has no losses due to modulating onto a carrier, and no noise added to the picture during transmission. Levels 4 & 5 exist as specifications although level 4 was transmitted by the IBA as long ago as 1981. There appears to be no television sets able to handle these levels, and until the editors of CEEFAX etc. use it, the extra cost would not be worth while. The currently transmitted level is Level 1. Teletext Ltd (Main independent Teletext Transmitter) has plans to introduce a Level 2 service from Autumn 1995. After the new Level 2.5 & 3.5 specifications have been set. Copyright � 2001 - 2019. All trademarks acknowledged.